In Box of Crayons, Alex, Leah, their frog Hopkins, and host Rachel Coleman share signs for all your favorite colors. 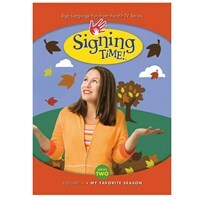 Plus, you'll have even more fun and signing practice through learning modules called Hopping Time and Story Time. Hi - Come - Friends - Now - Sign - Time - Teach - Singing - Dancing - Laughing - Playing - Now - Favorite - Visit - Tree - House - Everyday - Lots - Everyone - Play - Start - Meet - Find - Not - Different - Share - Wow - Silly - Forgot - Love - Learn - Help - New - Box - Need - Looking - 1 - 2 - 3 - 4 - Found - Broken - Great - Started - More - Practice - Song - Fall Down - Ready - Guess - Read - Book - Story - Rainbow - Salad - Eat - Fall Down - Ready - Read - Book - Story - Rainbow - Salad - Eat.